In reading this book, I tried to set aside the author’s well-documented disdain for C.S. Lewis and did my level best to consider this bit of middle-grade-ish fantasy in as objective of terms as possible. For the most part, I think I succeeded. Lyra is a wild, under-supervised young girl who’s essentially grown up on the campus of Oxford University’s Jordan College, in an alternate-reality steampunk version of England. She is blissfully ignorant of her world’s politics and “science” until she accidentally overhears her fiercely driven guardian and uncle, Lord Asriel, discussing a phenomenon called “dust.” Lyra’s dearest playmate, Roger, is abducted by a mysterious organization that is thought to experiment on children—and at almost the same time, Lord Asriel is detained for his heretical ideas. This kicks off Lyra’s adventurous journey up North to rescue both of them; along with whispers about Lyra being some sort of prophesied savior who, for some unspecified reason, cannot know of what she’s meant to do. Pullman’s writing is largely effective, and occasionally affecting. This reader personally enjoyed his word choices and pleasing manner of sentence assembly. Descriptions are vivid, and high action scenes are laid out with marked skill. The pacing was fairly consistent and never lagged enough to dissuade interest. Most noteworthy, in this reader’s mind, is the novel worldbuilding concept the author presents in the form of the ‘daemon’—an external representation of a human’s soul. The daemon come in animal form—both real and mythical—and can alter their shape on a whim up until a child hits puberty when, for reasons unexplained, the daemon settles on a permanent state. The emotional expressionism and interaction between daemons provided an exceptionally memorable aspect to the storytelling. The naturalness of their existence and the unspoken rule surrounding them (namely that people don’t have any physical contact with another person’s daemon) was enriching to the plot at large. Speaking as a former barefooted heathen tomboy who ran amuck most of my childhood, I found Lyra flat and unrelatable. Her sense of compassion was fickle at best, and the story seemed to continually highlight her capacity for lying as a featured virtue. Toward the middle of the story I did finally warm up enough to feel pity for her over the utter neglect she’d grown up with as the child of two ravenous sociopaths. Her interactions with the bear caused just enough character development to make her more well-rounded and tolerable. But still, I found I cared more about what happened to several of the side characters than I did our heroine. Roger, Lyra’s supposed best friend and primary motivation for her perilous adventure, was disappointingly underdeveloped. With no real backstory and only a few handfuls of dialogue at the very beginning and very end, it’s difficult to feel any attachment or concern for him. Lyra herself seems to spend most of her time getting wrapped up in her travels and largely forgetting her friend is in peril. Though I found the ‘daemon’ concept fascinating and original, I do wish there was some explanation (or even speculation) on why a person’s daemon almost always manifested as a being of the opposite gender. It also wasn’t apparent as to what extent their existence was corporeal. Toward the ending it becomes clear that if a daemon is killed, its human dies as well. But the daemons come across more as energy-based rather than flesh and blood, so it’s unclear as to what degree or form of violence it takes to kill them. Their limitations also go unexplained. While there seems some correlation between the person’s personality and what sort of animal form their daemon ultimately settles on, the range depicted is something as small as a moth, to as large as a leopard. There is even a case noted where the chosen form was aquatic, which essentially meant its human could never again set foot on land. However, if there is a size/mass cap for their transformations, it’s never mentioned. This reader tends to agree with those who would assert this as a book best meant for adult audiences, which just so happens to have a child as its main character. Heavy in cynicism, bleak in conclusion, and lacking in child-like wonderment; this isn’t a story I’d recommend for kids. For all characters, the ends seem to justify the means. And from a parental standpoint, I didn’t find enough redemptive about the story to justify introducing it to my children--even after what feels like the appropriate age of 12. There are too many other middle-grade (and MG-appropriate) fantasy works out there with better plotlines and more inspiring messages to offer. Lyria and her daemon Pantalaimon must rescue their friends from the evil Gobblers, kidnappers that take the children north to do terrible experiments. Lyria must use the alethiometer, a truth-telling device, to learn able the mysterious Dust and help a world on the brink of war. Daemons are a person's soul that walks beside them and take an animal form that most resembles their true nature. During childhood the daemon doesn't settle into one form but can change at will. This is thought to be because Dust doesn't settle on people until they hit puberty. The mystery of this seems to be something the series will explore as it continues. Lyria's journey to the north is filled with obstacles and trials which help Lyria develop and grow. There is a destiny that surrounds Lyria though she must never know, that she must fulfil on her own. This is gradually revealed more, tough not entirely. Upon reading Philip Pullman’s "The Golden Compass" my first thought was that I have to find me an armored bear. My second thought was how this book is jam packed with such high concept ideas for a young adult book. First there’s the whole issue with religion in Pullman’s world. The Church is way out to get everybody, and I imagine some people have had issues with this in the past. Pullman never implies that all religion is this way. Instead he sort of relives how the church acted during the Spanish Inquisition. I’m sure some people got their feathers all ruffled up by this though. The next detailed concept is that of essentially having a physical manifestation of your soul in the form of an animal that is invisibly linked to your being. At face value, these daemons could be looked at as just a fun pet that goes everywhere with you, but they’re so much more than that. The final form your daemon chooses reflects overriding characteristics within yourself, for example people within the service industry tend to have dogs as their daemons with their intense loyalty to serve a master. That brings up the whole class issue that’s consistently present within this book. The book has a middle of the 20th century feel to it, with clear distinctions between who and what an individual with power, money and influence should look like. This might go over the heads of younger readers, but it’s so there! This really resonates with the 1% theme that is present in American politics. Finally, the most detailed and confusing yet utterly fascinating concept of all is that of Dust. Scientifically, Dust consists of elementary particles that can’t be broken down into any simpler form. The Church is convinced that Dust is the source of sin, but it’s clear that Dust also has a part to play in the connection between a human and his or her daemon. Pullman’s description of just what Dust is remains confusing throughout the novel until the very end, and I’ve heard a lot of complaints about that. I think, however, this confusion only increases the mystery of the particles as readers are just as in the dark as main character Lyra is about Dust, and we only find out more concrete details about these particles when Lyra does. While some people find it off-putting, I think it’s the intricate detail of Pullman’s world in "The Golden Compass" that makes Pullman’s His Dark Materials trilogy so unique. And despite whether or not we can grasp the concept of Dust, we’ve all wondered just what our daemon would be. (I’m keeping my fingers crossed for puppy or koala bear). Wonderfully high concept original ideas. Resulting conversations on what your daemon would be. It is rare for a genre YA book in recent years to wield language with the sensibility and virtuosity of the 19th century writers, but Pullman has that gift, as natural to him as water running downhill. Enter a world unlike any other, connect with the endearingly flawed and independent Lyra Bellaqua, and cheer for her as she battles against two of the most compelling villains of recent times - her own parents. You'll love this! Check it out! What do you get when you combine a fantastical adventure with the most sickening bad-guys lurking around in the shadows? Wait, hold on. And a pinch of Daemons, a rough-housed heroine that doesnt take any crap, and an organization that threatens to destroy the most sacred of bonds. . . Now, what do you get? Roughly, The Golden Compass by Philip Pullman, though his tale also contains talking bears, gypsies, and a portal to another world through the Aurora. But you get the idea. My friend Nicole read this (and the other two) book near Christmas and fell in love with it enough to literally chuck the tome at my head and shout, Read this or Ill disown you! So, being the friend (and coward) I am, I picked it up and read it. And, holy crickets! It was amazing! I adore Lyra and her down-to-earth wit and stubbornness. And her darling Pan oh! It made me wish for my own Daemon! The whole organization thing made me feel sick though and youll understand when you pick this up to read it. Im being serious. Drop what you have now and pick up this book! You will be thanking me afterward!! The Golden Compass is the first book in a trilogy written by Phillip Pullman. In it, you have the courageous, lion-hearted Lyra, her daemon Pan, and a whole bunch of mischief turned adventure. When Lyra first hears the word Dust, she has no idea of how much her life will revolve around such a concept. In The Golden Compass, she sets out merely to save a friend, but the journey she takes lasts a lot longer than even she will realize. With antagonists such as Lord Asriel, Mrs. Coulter, and the The Gobblers, Lyra's life will never be the same. Her story travels across time, and worlds, as Phillip Pullman puts together a story that will have you on the edge of your seat the entire time. It's a book that everyone should read at least once in their lifetime. If it makes you jump for the book faster, it cane definitely hold it's own against the Harry Potter series. High Adventure for Older YA Readers! The character at the heart of this book is Lyra. She is a young, yet spirited soul destined for things far greater than her courage or confidence even know. Though presented as a ward of Jordan college, her true father (and mother) is revealed over the course of the story. Her world is one of exploration and stories. Unfortunately, one story about a group called "the Gobblers" that is said to steal children in the middle of the night hits close to home with the disappearance of her best friend Roger. Lyra, along with her daemon Pan (their daemon is a version of their conscience manifested in animal form), sets out on a quest to rescue her friend from the clutches of evil and encounters an adventure she won't soon forget. Released in movie format bearing the same name, the film does not end where the book ends! The producers were going for a happier ending when in fact the book ends on a rather sad note. Death, religion, and the battle for control over our very natures, lie in the center of this dark tale. Interesting? Yes. Hard to get into? For me at least, yes. Worth following through? Yes. Recommended for the older set of readers within this genre. Happy reading! Pullman has created a rich and vivid story about a girl named Lyra and a substance called dust. Lyra lives in a world is much like our own, except with the existence of daemons, which are physical embodiments of our soul in the form of animals. The first book in the trilogy introduces us to dust, and why so many people are eager to use it to their advantage. Full of mysteries and twists, this is a book that will keep you reading until the end. The Golden Compass was a great book that took time, and was written by an ingenius mind. I watched the movie recently, but as always, the book was way better. Pullman made me long for a daemon myself. It made me breathe so hard at times and kept me at the edge of my seat, and also made me smile every now and then. This is a treasure you want to slip into your pocket Harry Potter and Narnia fans. Don't be surprised when you finish the last page of the book, you're going to pick up the sequel, and soon the trilology. This one is a 5 star!! 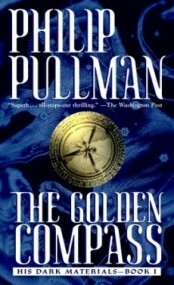 The Golden compass" is the first book in Phillip Pullman's "Dark Materials" triology. From my point of view, this is one of those books that you simply must read if you are a science fiction fan, or if you simply like a well-written book... However, take into account that reading this book means that you will also have to read the other two books in the series, if you want to know how the story continues. The "Dark Materials" triology takes place in a world similar to our own, that is at the same time very different. In that world, each person's soul can be seen, is called a "daemon" and takes the form of an animal. The daemons of children change their appearance constantly, but once the children become adults, their daemons choose only one form. Pullman's alternate world has other differences, too, for example the fact that it has different kinds of magic, and that witches and armored bears coexist with human beings. The result is that the world he builds is exotic, strange but at the same time familiar. On the negative side, the writer also plays with an institution we are familiar with, the Church, using its name but leaving behind its essence, in order to talk about a world ruled by tyrannical ecclesiastical authorities. I didn't like that, and probably you won't like it either, but keep in mind that this is a work of fiction, and as such, its purpose is to entertain, not to be taken seriously. All the same, if you think your sensibilities will be offended, or that you won't be able to separate reality from fiction, don't buy this book. You will be losing a lot, though. After reading "The Golden compass", I realize it deserves its reputation as a masterpiece of science fiction, and I regret not having read it before. On the whole, I think that this book is a treat teenagers and adults will enjoy, but I believe it may be too complicated and somber at times for children. Just when I thought I had run out of books!! At first I couldn't get into this book. It was interesting...but not anything special. But as I read on and on, it morfed in to something more...Something so entoxicating that it made me want to read it forever! It is such an interesting change from the common magic stories of Harry Potter and Eragon, not to put those books down, they are still my all-time favorites! But this was just so...so...Well...you'll see! PS! Don't give up after the first couple of pages! Give it plenty of time. There is a lot that you won't understand at first but don't worry, because it is explained later!! Enjoy!